With the huge success that was How To Train Your Dragon in 2010, it was probably no surprise that DreamWorks greenlighted a sequel, some straight-to-DVD specials, a TV Christmas special, and even a TV series. 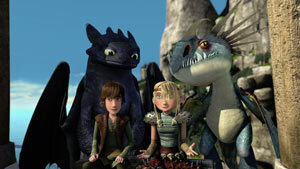 FOX and DreamWorks brought Dragons: Riders of Berk to the small screen with 20 episodes starting in 2012 (with plans of a second season in the works supposedly). Surprisingly enough, actor Jay Baruchel, who voiced the lead character of Hiccup in the original film returns for the television series, as does America Ferrera, T.J. Miller, and Christopher Mintz-Plasse. The rest of the cast is rounded out with sound-alike actors who do a great job replicating the original voices and tones of the original characters. The show also introduces new characters for the small town of Berk, including Mildew (voiced by Stephen Root), who hates that dragons live in Berk now, and Bucket, who is voiced by Thomas F. Wilson, who played Biff in the Back to the Future trilogy. And a new villain is introduced to the mythology, a viking named Alvin the Treacherous, voiced unrecognizably by the original Luke Skywalker himself, Mark Hamill. I loved the original feature film, but upon watching the first few episodes of Riders of Berk, I got the feeling they were trying too hard to add stories into a world that didn’t have as many stories to tell. Thankfully, as Season One progressed, I found that I was terribly wrong. The series begins focusing on the townsfolk in Berk and their reactions to the presence of dragons, and then progresses to Hiccup taking on a bigger role of training dragons in a sort of dragon academy, and convincing everyone in Berk that the dragons need to stay. Mildew becomes the main foil for this as well, as evidenced in the unofficial two-parter of “In Dragons We Trust” and “Alvin and the Outcasts.” But the show really focuses on developing the camaraderie between the main kids: Hiccup, Astrid, Snotlout, Fishlegs, and the twins Tuffnut and Ruffnut. And while they met their own dragons in the feature film, we see them develop their relationships with their respective dragons in the TV series. The show really seems to find its strength in those storylines. However, “How to Pick Your Dragon” is a wonderful episode where Hiccup encourages his father, Stoick, to find a dragon for himself to ride, and it seems like only a natural progression of the story and his character. “Portrait of Hiccup as a Buff Man” is another fun one that sees Hiccup setting out on an Indiana Jones-style quest for treasure to prove his manliness to his father. Alvin The Treacherous, meanwhile, is a unique villain to the series as he hopes to steal the knowledge of how to train dragons so that he can have the upperhand and conquer the town of Berk. And the season concludes on a note that leaves you guessing what the future might hold in store if Alvin gets this power. The season, curiously, is split up into separate DVD sets: Part 1 and Part 2. Both sets include 2 discs-worth of material and just a couple little extras. The first Part includes 11 episodes (including the two-part episode “Heather Report”), while Part 2 includes 9, totalling the 20 episodes from the first season. Honestly, I can’t for the life of me understand why they were released in two separate sets. You need both to complete a full season and I don’t see why you’d buy either apart from the other (Thankfully, however, the pricing of the two of them on Amazon is about in line with what a full season on DVD would normally cost). Still, if you’re a fan of the movie, the show is well worth checking out. The absence of some of the major acting talent from the movie isn’t really missed, as the fill-ins do a strong job. Jonah Hill isn’t missed either since Zack Pearlman sounds nearly exactly like him as Snotlout, and Julie Marcus replaces Kristen Wiig as Ruffnut but does an excellent job as well. T.J. Miller returns as her twin brother Ruffnut and the twosome easily produce some of the show’s best laughs. The writing feels pretty well in line with the quality of the movie and the show, for the most part, is a wonderful continuation of what the movie established. The animation isn’t quite as textured or as fluid as the movie, but it’s very high quality for a TV show and seems to be a cut above the other DreamWorks TV series they launched for Kung Fu Panda. By the time the last Part of the set had finished, I was curious to see where the show could go from here. The content for the show is right in line with the film. The only concern for parents may be the violence and darker tone at times–not to mention some of the dragons could be scary to the kids. The violence is primarily slapstick violence–like the twins punching each other or hitting each other on the helmets for example, but there’s some fisticuffs between the vikings when Alvin’s in the picture, and there’s some violence between the dragons (Like Toothless fighting a Whispering Death dragon). We also often see axes and maces and other big viking weapons, but seldom see them in action. Overall, I’d say the show isn’t really suitable for little kids but those who had no problem with the feature film should be fine with what the show offers. 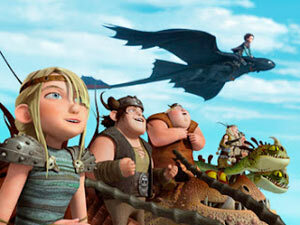 Overall, I was pretty impressed with Dragons: Riders of Berk. It’s a great spin-off from a wonderful film and it really develops the dragon-filled world of Berk and its inhabitants really nicely. 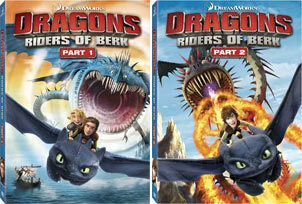 While some cartoon series based on feature films tend to pale in comparison to the material they’re based on, Dragons: Riders of Berk is the exception. Consider this reviewer a new fan — and definitely interested in Season Two. Dragon Tracker Part 1 (6:18) – This featurette brings up an interactive map with a few dragon species names that you can select to learn more about. You can also just do a “Play All” option to hear Hiccup narrate clips from the episodes that outline traits of the various kinds of new dragons: Thunderdrum, Typhoomerang, Scauldron, and Fireworm. Evolution of Thunderdrum (3:01) – This short featurette has the Visual FX Supervisor talking about Stoick’s dragon, who’s a Thunderdrum. Unfortunately, it’s the only behind-the-scenes look at design or anything on this set, which is unfortunate, because I’d have loved to hear more about the development of the series, the voice cast, etc. “Heavy metal” Dragon Mash-Up (2:21) is literally a montage of dragon scenes from the show set to cheesy hair metal music about them. Dragon Tracker Part 2 (6:05) – This is a continuation of the aforementioned featurette that, this time, covers the Smothering Smokebreath, Whispering Death, and the Changewing as explained by Hiccup. Evolution of Whispering Death (4:34) – The Visual FX Supervisor returns to talk about the details of the Whispering Death dragon and its design, and how powerful it is. “Fly High” Dragon Mash-Up (2:06) – This is another musical montage, but this time it’s set to fast rap rock. The special features are pretty weak, but the show isn’t, so the DVDs are still worth picking up.